As of 21 November 2002, Award Sites! no longer uses the 2.0 and 1.0 ratings. Description: The Chantel Graphic Designs Top Site Award "recognizes the hard work and creative ability of webmasters" and is presented to encourage the continuing development of their skills. Sites are evaluated on "presentation, originality, creativeness, functionality and effort." Citation: "Congratulations on winning my Top Site Award! I appreciate the opportunity to review your site. You are a great addition to the web! Keep up the great work! ... Thank you for your interest in our Awards Program and Congratulations on such a fine web site." Description: The Guice Family, aka the Guice 5, a Marine Corps family web site by Kimberly Guice, administers the Guice 5 Awards program which makes awards in numerous categories to family friendly sites which are well designed with easy navigation. The "Cool Site Award" recognizes "sites that are really cool!" The "Beary Good Online Friend Award" recognizes sites which promote friendship on the Internet. Citation: "Very nice site. :o) I would like to present you with the Beary Good Online Friend Award because you truly are to create such a site and the Cool Site Award." Description: Mylo, an Italian sci-fi and fantasy web site, recognizes well organized sites with pleasant graphics and good content which have reasonable download times. Citation: In Italian: "Complimenti, il Suo Eccellente Sito ha vinto il 'Mylo Award Gold.'" In English: "Congratulation, His Excellent Site has won the 'Mylo Award Gold.'" Description: David and Becky Russ of Rocky Ridge Ranch in Abingdon, Virginia, present awards to recognize fellow donkey web sites and general web sites as well. Sites are evaluated on content, load time, navigation, spelling, and cross browser compatibility. Citation: "I have evaluated your website and found that your website is very worthy of the following award; I have awarded you with Best Of The Web 3 Star Website Award. Keep up the good work and hard effort." Description: Donna, aka MomPeepers, is "always in search of new and fun places to visit on the web" and recognizes family safe sites with content that is fun when she finds them. Citation: "Very nice job on the reunion website! Good luck finding all your classmates." Description: Peggy's Purple Paradise presents awards in several categories. Sites are evaluated on content, navigation, graphics, and load time. Citation: "Congratulations!! You've won the "Peggy's Purple Paradise Award of Excellence." Your site is very well put together, and I am proud to have the opportunity to be included in it. ... Thank you for taking the time to apply for my award!" Description: WM8C, aka Todd Strait, a ham radio operator from Michigan, offers several awards to other web designers and their sites. Citation: "Your site is very well done. You have created a great place for your class to stay current. You scored a little lower in content because your site is of most interest to your alumni, (see content criteria), but a great job none the less! Keep up the great work. Great Job!" Description: The KoolKat Site Awards "recognize amateur webmasters for hard work & dedication it takes to create a great website." Citation: "We have visited your site and find it to be a very well designed site, packed full of content! 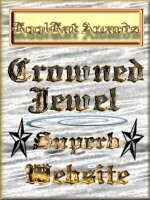 You should be proud of the time and effort you have put into your site, and we would like to award you with our 'KoolKat Crowned Jewel' Award!"